ARGOIL Renew Hair Mask banishes frizz - Susan Said... WHAT?! Contrary to popular legend, Washington, D.C. was not built on a swamp. But, on the hot, humid days of September, you would never know it! And, since humidity is the enemy of my curly (but straightened) and colored hair, I will do anything to combat it while visiting my daughter in the city. After all, I can’t walk around looking like a poodle. To quickly tame frizz, my simple trick is to use argan oil. Argan oil is derived from the kernels of Moroccan argan trees and is well-known for its vitamin E and essential fatty acids, which add vitality, softness, and gloss to hair. So, I use it in my shampoo, conditioner, and even directly on wet hair before styling. 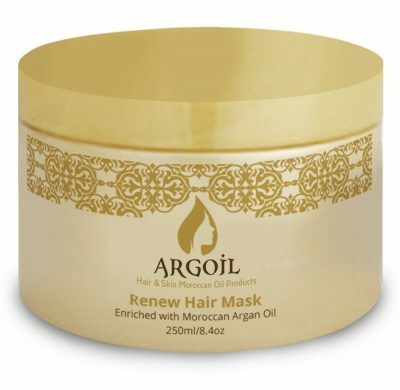 And, one of my favorite new argan oil products is ARGOIL Renew Hair Mask. This is a dense, creamy hair mask enriched with Moroccan Argan Oil, Shea Butter and plant oils. Used once a week, this mask deeply nourishes and treats dry hair. Hair is softer, straighter, and — most importantly — frizz-free. What makes this hair mask different from a regular, everyday conditioner is the deep conditioning that it provides. Unlike a daily conditioner, which only rests on the surface of a hair strand, a hair mask actually works its way inside the hair cuticle. ARGOIL Renew Hair Mask is very easy to use. Simply apply to clean, towel-dried, damp hair. Use a generous amount beginning at the scalp and working towards the ends. For my very long hair, I use about a silver dollar sized scoop. (I also like to comb it through to make sure I reach every strand.) Leave the treatment in for 5 to 15 minutes. Rinse and style as usual. And, voila! Gorgeous, soft, frizz-free hair all ready to hit the town. ARGOIL Renew Hair Mask is available at Amazon Prime for $26.92 for an 8.4 oz. jar. And, since you don’t need a lot, this jar should last a long time. To see the entire line of amazing argan oil products for hair and skin, visit Argoil. PHOTO: Image used with permission by ARGOIL. DISCLAIMER: No financial compensation was received in exchange for this post. I did, however, receive a promotional sample of the argan oil hair mask from ARGOIL in order to fully evaluate the product. Regardless, I only recommend products or services I believe will be good for my readers.